Herb (Randy Quaid), the only person in America who’s never had a Burger King Whopper, gives his explanation. This was a spoof of a then-current Burger King advertising campaign which ultimately fizzled out a short time later; it’s a little funnier if you’re aware of the commercials this parodies (the caption with Herb’s name uses a similar font to the ads), but this is a prime example of the dangers of topical pop culture parodies: if the subject fades into obscurity, it’s harder for audiences to get the joke if they’re watching years later. That said, Quaid does his usual good job here, and his solemn tale of how he ended up in the wheelchair had some funny parts (he had an allergic reaction to the glue that the restaurant used to hold their hamburgers together during lengthy cross-country shipping). 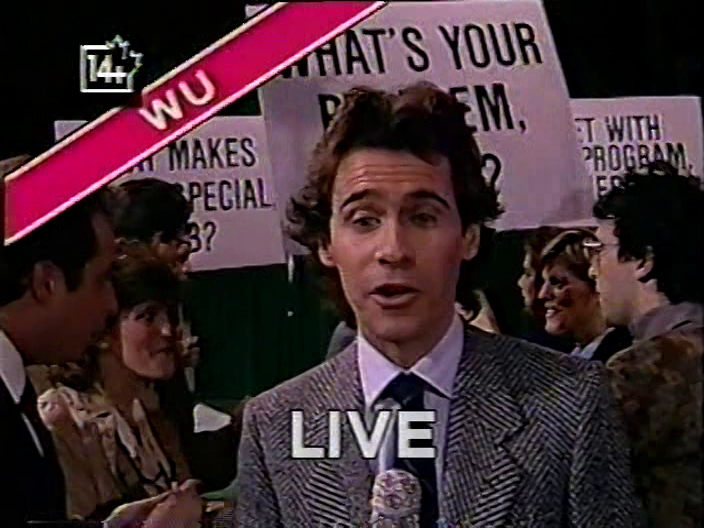 Another rare appearance by Dennis Miller outside the confines of the Weekend Update desk; a number of the cast, writers, and production staff (plus stand-up comedian Allan Havey, who was a bit player on The New Show) also appear as the reporters at the press conference chanting “We want Herb!”; Robert Smigel’s shaking his sign pretty hard. This Mentalfloss article provides some background on the real Where’s Herb? campaign. The theme is played at a noticeably faster tempo tonight. The still shots for Anthony Michael Hall, Jon Lovitz and Terry Sweeney have been updated with the pictures used for the rest of the season. Cheryl Hardwick joins the rest of the SNL Band in the loft tonight; Yogi Horton and Tony Garnier fill in for Steve Ferrone and T-Bone Wolk, respectively. 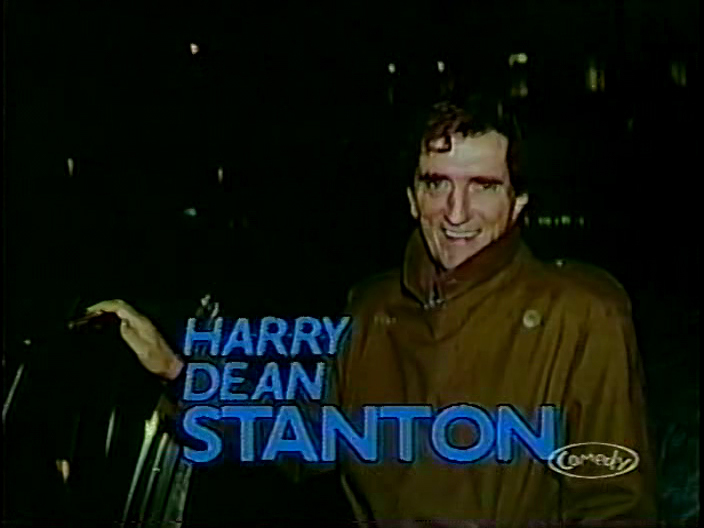 Harry Dean Stanton sings “Baby What You Want Me To Do” with the SNL Band. 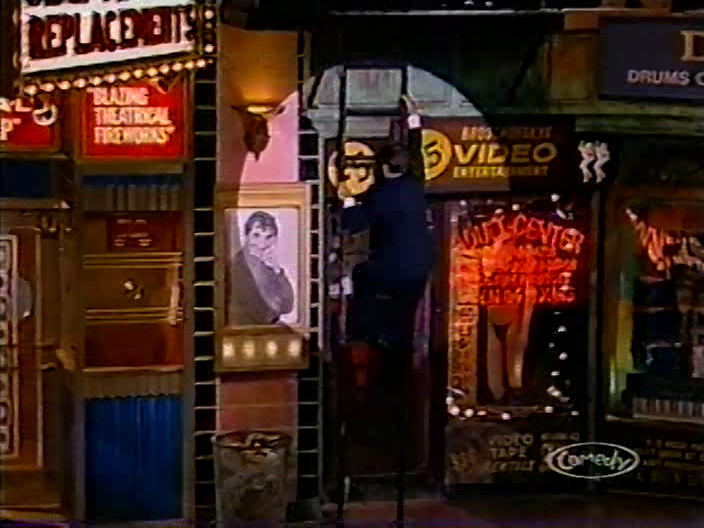 There isn’t much in terms of comedy here, mainly Stanton singing a cover of Jimmy Reed’s 1959 blues song, but it has a fun vibe (including Stanton climbing the fire escape ladder up to the loft where the band plays); this also foreshadows the SNL Band’s increasing prominence over the coming years. Stanton seems a little out of it here; he flubs his line comparing working with “this bunch” to being held captive by the SLA (he says “SLO”, then ad-libs “ah well, forget that”).. In 2016, Rolling Stone published an excerpt of Bob Mehr’s Replacements biography Trouble Boys, which gives more background on the ‘Mats infamous drunken appearance in tonight’s show; according to Mehr, Stanton joined the band for drinks in their dressing room. The name of the music store on the home base set has been changed to “Drewniak Music” to fit the Cleveland Vice sketch that appears tonight. 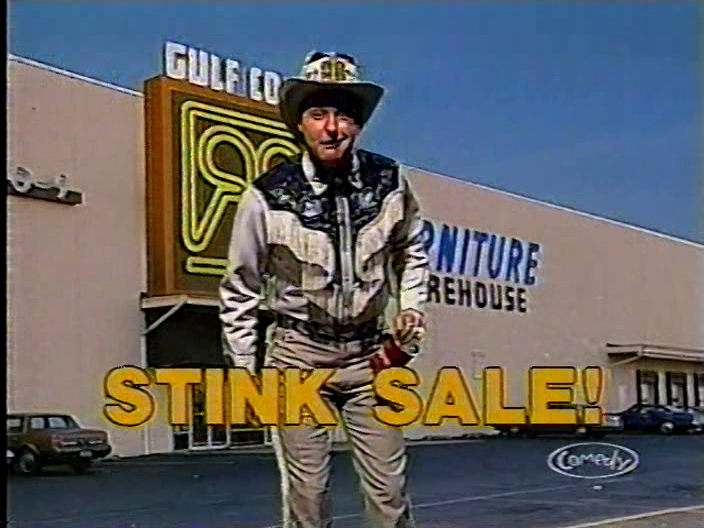 Double R’s (Randy Quaid) father dropped dead in the warehouse and they didn’t find him for weeks, so they’re selling all their furniture with an odor at a huge discount. Lowbrow as all hell, but I thought this was a little better than the previous Double R sketch. Downey’s goofy clapping dance always makes me laugh. It looks like Quaid screwed up one of his lines at the beginning (he says he was in Europe “last night” when his dad dropped dead in the warehouse, then says it was “four weeks” before they found him). Stas Gusic (Randy Quaid) and Mike Kutasz (Harry Dean Stanton) investigate bowling ball thefts from the Buckeye Lanes. An ambitious mess. 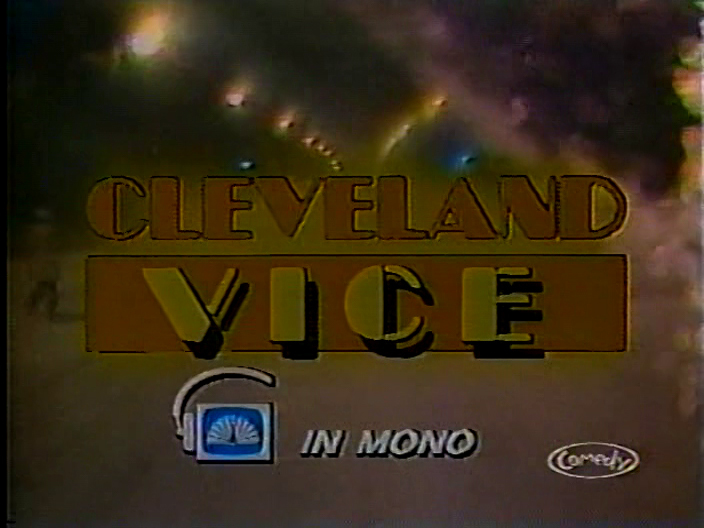 This 8-minute sketch spreads across multiple sets (including a nice use of the home base storefronts) and includes a full-length parody of the Miami Vice opening titles (featuring stock footage of Cleveland in wintertime and a parade of Slavic names in the credits), and has some funny moments (the “stuck to a lamppost” reveal, the cops having to take a suspect back to the station via bus) but the whole thing just fails to gel. Quaid’s “I’m sorry I’m late, buddy” seems to be an ad-lib, since he had to do a quick change from his Double R costume immediately before. He also messes up his line while arresting Robert Downey Jr. (he calls the bowling alley “Bennett Lanes” instead of Buckeye Lanes; Jon Lovitz’s shady obstetrician is named Dr. Bennett)..
I’m not sure what the point of the scene with Danitra Vance and Terry Sweeney as Joan Rivers is; it really feels tacked on. Writer Carol Leifer gets a line of dialogue as one of the suspicious-looking obstetrics patients at the beginning; one of the other non-speaking patients is Rhonda Coullet, who wrote and performed “West Heaven” in the John Belushi tribute film that appeared on the show three years before. 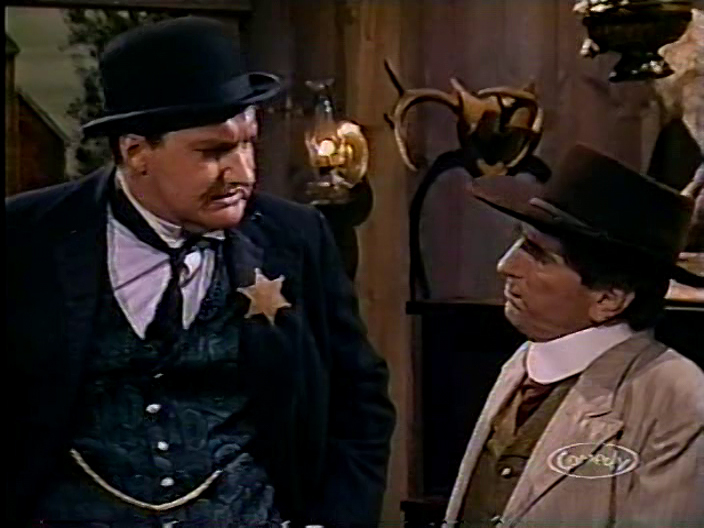 Bat Masterson (Randy Quaid) and Jesse (Harry Dean Stanton) have trouble working out the particulars of scheduling a shootout. The audience didn’t really respond much to this, but I liked how many ridiculous jokes were packed into such a short sketch. It probably would have worked a little better with the 1986-90 cast, or at least be better remembered. The plot is also very similar to the conclusion of a New Show parody of The Hustler where Minnesota Fats (John Candy) and Fast Eddie Felson (Kevin Kline) struggle to schedule their rematch. I’m pretty sure that’s Cheryl Hardwick with her back to the camera as the saloon piano player. Written by Jack Handey (per A. Whitney Brown); according to an April 1986 article in Cosmopolitan, this was originally intended for the Chevy Chase episode. The infamous drunken performance, with the band playing loud and sloppy, Paul Westerberg walking away from the microphone during the second chorus, shouting “come on, fucker!” at Bob Stinson before his solo, and giving an exaggerated vaudeville wink after “the ones that love us the least are the ones we’ll die to please” (according to Mehr, this was directed at a frowning Al Franken). Sounds like someone is clearing their throat a few times during the performance, notably during the “Take it, it’s yours” outro. New father Steve Rifkin (Jon Lovitz) is still sore about what his wife (Joan Cusack) said about him while giving birth. This one just didn’t work; I’m not sure what Lovitz was going for in his acting choice but his and Cusack’s performances really came across as even more stilted than the writing. Maybe it’s just that by this point, both performers have shown they were capable of better, but it really seems to detract from the sketch (which wasn’t very good to begin with). Danitra Vance’s dyslexia gets in the way of her cue card reading here; she addresses Cusack as “Mrs. O- Mrs. Rishkin - Rifkin” (she’s starting to say Ostrow, the name of the person who gave the gift and card - also the name of the old boyfriend Cusack mentioned she wishes she married in her delerium). This sketch uses the same picture of Houston’s Hermann Hospital for the establishing shot as the Ed Grimley Hospital sketch the year before. Short Update tonight (just over 5 minutes long) with no guest commentaries, but the audience liked a lot of Dennis Miller’s jokes (aside from a dry spot on the middle) and gave some clapter to the punchline of Sen. Jesse Helms being among the Martin Luther King day closures. The Ecuadorian bus crash joke was pretty bad, though. Thanks to her agent Seymour (Terry Sweeney), Latoya Marie (Danitra Vance) gets an audition for Lionel Garland’s (Harry Dean Stanton) Broadway play Debutante Ball. Vance and Damon Wayans are great here, and the videotaped spoof of the That Girl opening titles (directed by Matthew Meshekoff, complete with repeated references to hair relaxer and a scene of the cab passing her by to pick up a white guy) scores with the audience, but the whole thing fails to live up to its potential. 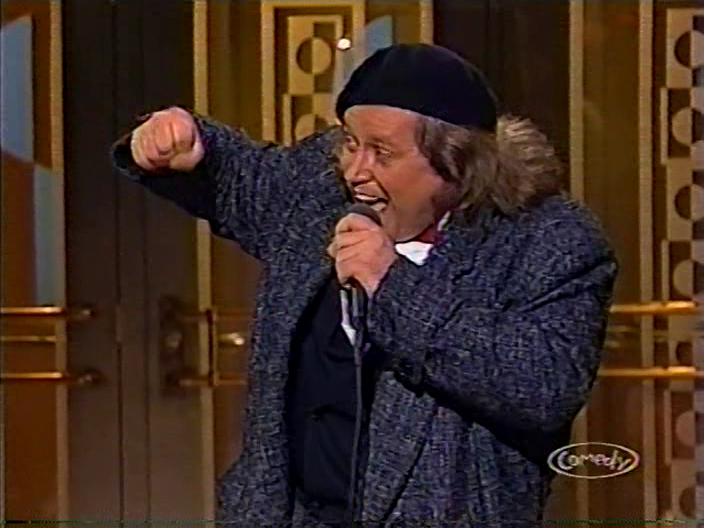 Sam Kinison warns of the potential for donut shop employees to snap and discusses honesty in relationships. This is a little better than the routine that aired in the original broadcast of Lithgow, though there are a few particularly ugly parts (the “I don’t support wife-beating; I understand it but I don’t support it”; Kinson gleefully describing driving an ex to therapy), but overall this is tighter and has a good build to the screaming in the first part. Vinnie Barber (Jon Lovitz) presents footage of the 1914 Balkan Dirt Diving competition at Bratislava. One of the weirdest sketches of the season; aside from Lovitz’s live intro and outro, most of it is a pre-tape made to look like scratchy archival footage that features none of the regular cast on screen and Al Franken doing a voiceover (his dry and halting delivery is pretty funny). That said, this was pretty funny, with some nice little details sprinkled through (the guy with the eyepatch raising the platform, an old man with a long beard taking a bite out of a loaf of bread during the hushed silence). I love the “NEEEP!” sound the one diver makes when he falls from the platform. Any idea who wrote this or directed the footage? There’s no director credit for this piece in the show’s goodnights. 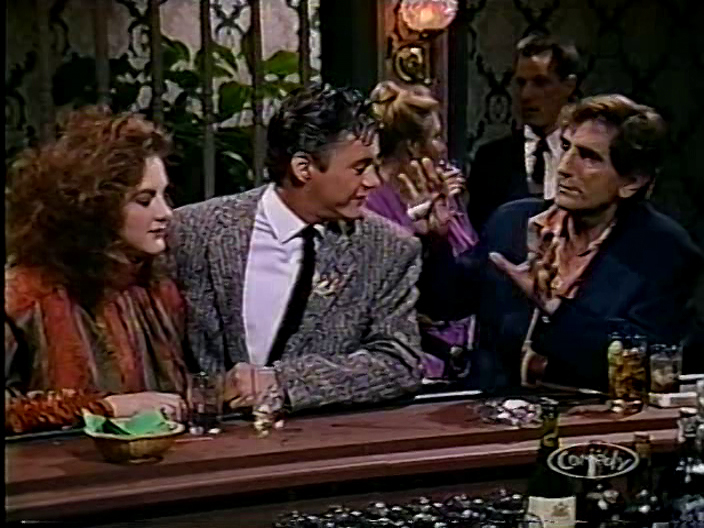 Nosy drunk (Harry Dean Stanton) repeatedly jumps into a couple’s (Joan Cusack and Robert Downey Jr.) private conversation. Stanton’s best sketch of the night; this was a low key character piece, and while it wasn’t one of the show’s best in that genre, the audience was receptive and it did grow on me as it went on. ﻿Not quite as chaotic as the performance of “Bastards of Young”, but this has a more ominous sound compared to the version on Tim. A linen store wastes no time in tastelessly commercializing Martin Luther King Day with a white sale. 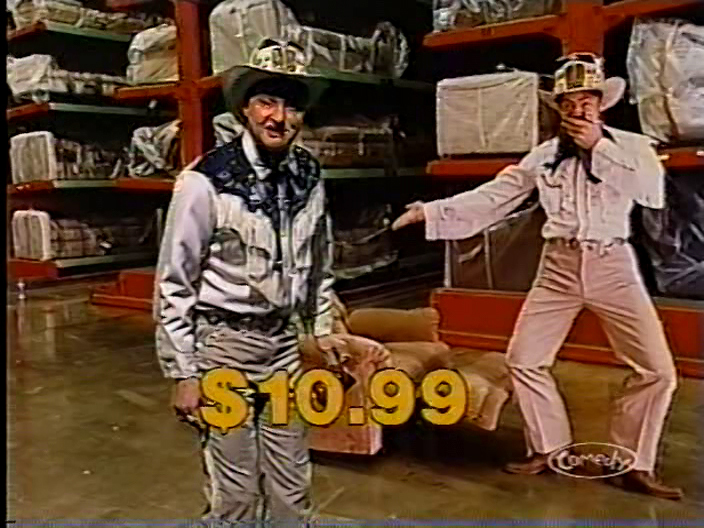 This was pretty much a dead-on spoof of bad local advertising; if Jon Lovitz excitedly saying hilariously tasteless things like “We shall overcome high prices” and “March on down for the King, King, King-sized savings!” wasn’t funny enough in itself, the cutaways bring this to another level (“Elementary, my dear Sitting Bull. Low overhead means low prices!”). This was the first year Martin Luther King Jr’s birthday was observed as a national holiday in the United States. Anthony Michael Hall’s only appearance tonight, as he was back filming Out of Bounds; he would also miss the next four shows. According to Mark McKinney, there was a sketch cut from air called “Wandering President” that was written by either Jim Downey or Jack Handey. ﻿Sam Kinison can be heard prompting Harry Dean Stanton (“There you are”) at the beginning; Kinson is arm and arm with Stanton and Danitra Vance, and several in the cast join in in a Kinison-scream and give Stanton big hugs (Randy Quaid gives him a peck on the cheek). 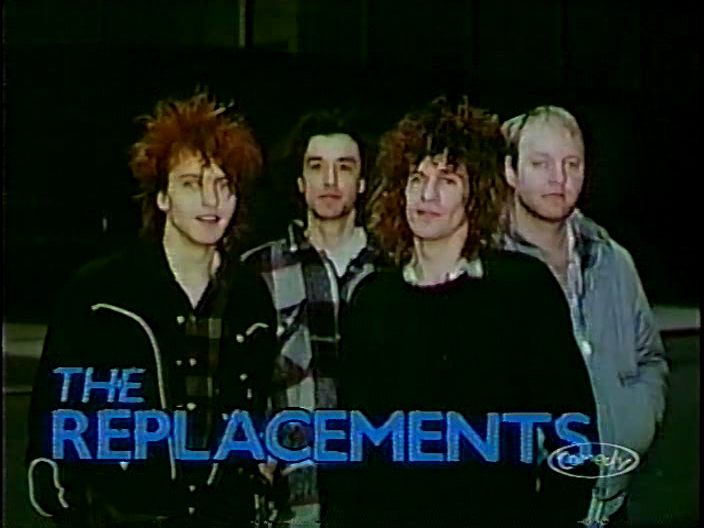 Bob Stinson crosses over in front of everyone to join the rest of the Replacements, who all run off early. Don Pardo announces the next show with Dudley Moore and Al Green and wishes the viewers at home a happy Martin Luther King Day. Susy Schneider is no longer credited as a writer. Someone forgot to update the year on the copyright notice at the end of the credit crawl (fourth screencap above). A mixed bag, with the bigger sketches falling far short of their ambition, but the night was sprinkled with enough smaller pieces that worked to prevent this show from being a total washout. 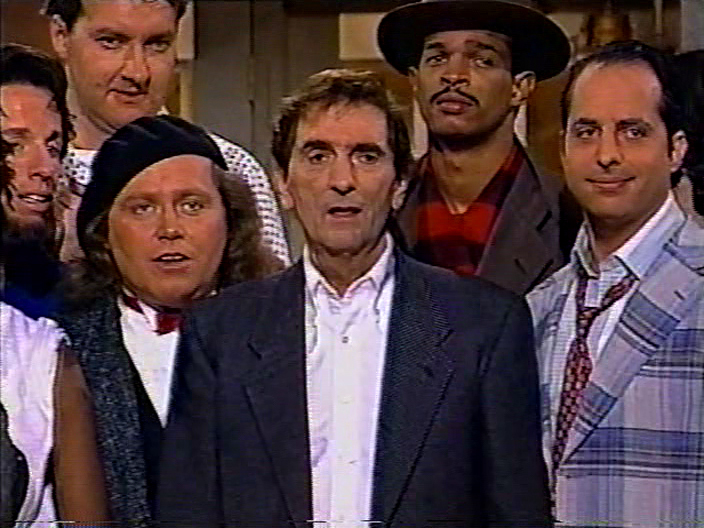 As a host, Harry Dean Stanton was stiff and occasionally didn’t seem to be occupying the same reality as everyone else, but his monologue was fun, and the cast and Kinison seemed especially warm towards him. As well, while Randy Quaid continues to be the show’s heavy lifter, Jon Lovitz is starting to emerge as a solid utility player. 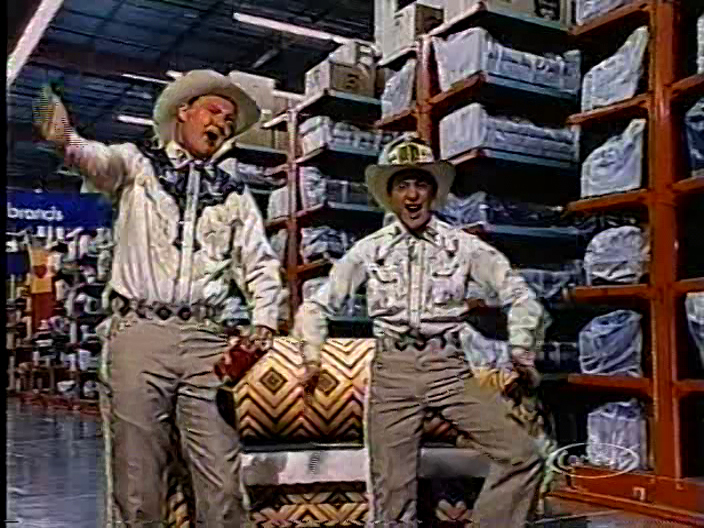 The Replacements’ performances pretty much overshadow pretty much everything in the show, though.